The Reds gave Chipper a base yesterday to acknowledge his great career. 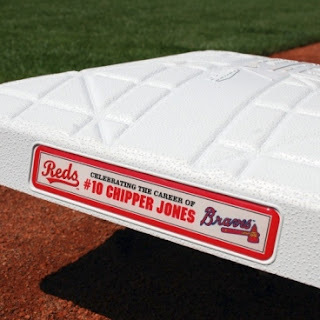 Too bad the Braves decided we weren't going to put anybody on those bases to celebrate﻿. We had two hits. TWO. That's one away from me going full Harry Doyle in Major League. Juan Fransisco had a home run, and Dan Uggla had a hit. So, instead of going out there and clubbing a bad Reds pitcher with an 0-5 record. We let him 2 hit us for 8 innings and get his first win. We beat the Rays two best pitchers in the last series and lose to the AAA call up. WHAT? WHY ARE YOU DOING THIS TO ME BRAVES!?!? Mike Minor needs to go away. We can't win games with him on the mound right now. It's obvious nobody in the dugout trusts him or will hit for him. Also, no pitcher has given up more home runs in the majors this year. It doesn't help when you give up back to back to back homers with two outs. Not one, not two, but THREE homers in a row. AND ONE OF THEM WAS TO THE FREAKING PITCHER! Leake's never hit a home run in his career, so he should buy Minor a steak dinner for the pleasure. Make sure to tip. You know what? I can't recap a game this horrible without mentioning that I knew going into it that it was going to be horrible. And yet it still managed to outpace my expectations of how horrible it would be in its horribleness. So what stats can we take away from this? None. Forget this game existed. Nobody on either team had a hit with RISP, all the runs were on homers, and saying it was like watching paint dry from the 5th inning would sully the good name of paint. The only upside was that it was mercifully short at 2:34 to finish. If you can't tell, I'm pissed that we keep doing this. We keep having amazing games and wins, only to be dashed against the rocks whenever Delgado or Minor take the mound. Fix this, Braves. Fix it now. There's no such thing as a 3 man rotation. Beachy takes over on the mound tonight. He's just the kind of tonic I need to mentally push past yesterday. With him out there making everyone feel comfortable, perhaps the hitters can find their groove again. The Braves bats must be unleashed. Hats for bats! They keep bats warm.